14° Mostly Sunny. Cool. Breezy. The final siren sounds and Collingwood have defeated Sydney by 8 points in a match that will go down as one of the greatest played in 2012. GOAL MAGPIESCollingwood win the centre clearance. It goes out for a throw in. From the contest, Jolly palms it down to Beams who kicks the sealer. What a game! GOAL SWANSThe ball is pumped inside 50 where McGlynn pounces on it. He turns and kicks a goal! Two points the difference. GOAL MAGPIESBlair kicks to the square where Cloke takes the contested mark. He plays on and kicks what would more than likely be the match winning goal. Collingwood by 8 points. BEHIND SWANSBrown rushes the ball through under pressure. Goodes kicks it out on the full from 50 metres out directly in front. BEHIND SWANSJetta marks it on the 50. He confidently goes back and takes a shot. It starts right and it stays right. BEHIND MAGPIESElliott pounces on the loose ball and snaps, but he misses to the right. BEHIND MAGPIESCloke marks out in front of his face but the shot at goal is disappointing. 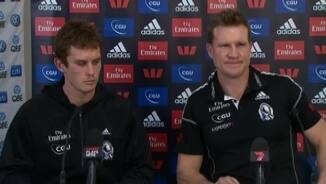 Collingwood are employing the numbers in defence. There is a long time to go in this match yet. BEHIND SWANSMcGlynn marks outside 50 but hooks it left going for distance. BEHIND SWANSKennedy handballs to Armstrong on the overlap. He breaks the tackle but his shot at goal misses to the right. This match will go to the death with only a kick in it the way it has been going. Sydney has not kicked a goal in over 20 minutes of play. They won't die wondering as they continue to pressure the Magpies. This is one of the best games of the season. No doubt about that. BEHIND SWANSKennedy rushes the kick from 40 metres out, but he misses to the left. Sydney has activated their substitute with Armstrong entering the Stadium. GOAL MAGPIESBlair marks it down low and he has the opportunity to put the Magpies in front. He goes back and slots it through. Collingwood in front! The Swans lead by one point at three quarter time. What a game. BEHIND SWANSRoberts-Thomson is tackled as he kicks it, but it bounces the wrong way. GOAL MAGPIESBeams runs on the outside of the clearance and takes possesion. He takes a step and kicks a beauty to level the scores! This game has been intense and tightly contested all the way. Don't let the low scoreline fool you. GOAL MAGPIESFasolo roves the ruck work and turns goalwards. He kicks around the corner and it's an excellent finish. Pies back to within a goal. BEHIND SWANSAnother rushed behind under pressure for the Swans. GOAL MAGPIESThis time it's Collingwood's time to challenge. Cloke is manhandled but still can take the grab. He kicks a much needed goal for the Magpies. GOAL SWANSBird gets down low much unlike a bird and takes a diving mark. From 45 metres out he sneaks it in for a goal. BEHIND SWANSJack runs into an open goal and misses disappointingly. BEHIND SWANSThe Magpies defence punch the ball through for a behind under pressure. GOAL SWANSFrom the boundary throw in Goodes takes it, spins around and kicks the goal. The crowd love him and no wonder why. The man is a legend! 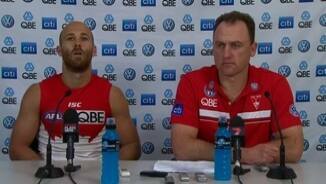 Swans by 9 points. GOAL MAGPIESCloke gathers the ball and handballs over to Wellingham who sells some candy. He keeps running and kicks the goal. GOAL SWANSSydney are paid a free kick for out of bounds on the full when the ball was actually punched out. O'Keefe bends it back for a goal. GOAL SWANSThe ball is kicked to the hot spot where Pyke falls into the chest mark at the front of the pack. From 15 metres out he goes BANG and the Swans put their noses in front. Sydney are really applying the screws at the minute. The footy hasn't been in Collingwood's half this quarter. The siren sounds for halftime with the Collingwood leading by 3 points. BEHIND SWANSReid punches it through for a rushed behind in the marking contest. BEHIND MAGPIESCloke marks out on the boundary but the kick goes left to right instead of right to left. GOAL MAGPIESDidak breaks one tackle, then another. He steadies before being pushed as he kicks it but it doesn't make a difference. Welcome back Alan Didak! Magpies in front. GOAL MAGPIESBeams sticks his boot at it and it gets through the congestion to bounce through for a goal. Collingwood are back. GOAL SWANSFasolo is dispossessed in defence and Kennedy is paid the free kick for holding the ball. Kennedy calmly goes back and slots it through. BEHIND MAGPIESDidak goes long looking for Jolly but it clears him and it's through for a behind. BEHIND SWANSJetta with a brilliant solo effort to win possession and set up McVeigh, but his bouncing kick smashes into the post. Collingwood have activated their sub with Didak coming on for Thomas. BEHIND SWANSO'Brien punches it through for a behind under pressure. GOAL SWANSGoodes handballs over the top to Roberts-Thomson who runs in and kicks the goal. The Swans regain the lead. It appears that your surname has to be hyphenated if you are to be a Swans goalkicker tonight. GOAL SWANSDennis-Lane marks it on a strong lead. From 45 metres out he splits the middle. It is a beautiful kick and the Swans are on the board. It is pretty much more of the same thus far in the second quarter. Both teams desperate for the football. 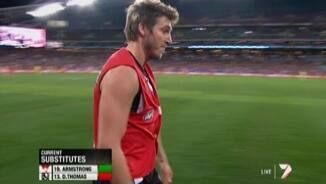 Collingwood leads by 11 points at quarter time but could be a man down with Thomas looking like he may not continue. BEHIND SWANSGoodes marks on the lead just before the siren. His kick after the siren misses to the left. We haven't had a goal for a while with Collingwood looking to their bench with Thomas possibly injured. It has been a low scoring quarter but certainly not a quarter that has been short of action. The contested football situation is very high. Collingwood has turned it around on the Swans after a slow start to the match. The wet weather may well fall in their favour. GOAL MAGPIESCollingwood pile on their third goal in succession. Seedsman marks it 30 metres out. He goes back and he likes it. The goal umpire likes it too! GOAL MAGPIESCloke does what he does best and that is take a good strong grab one out. He goes back and slots it through. GOAL MAGPIESFrom the boundary throw in Thomas reads it best. He turns and snaps it through for a classic rovers' goal. Collingwood have hit the front. BEHIND SWANSO'Keefe marks it 35 metres out. He normally gets these, but not this time. BEHIND MAGPIESTarrant uses his strength to mark it 30 metres out. His shot at goal is shocker and sneaks in for a behind. BEHIND MAGPIESDawes marks it just inside 50. He looks around before changing his mind. He takes the shot and it fades late to hit the post. There aren't any easy kicks out there at the moment. Both sides are ferocious at the football. GOAL SWANSRoberts-Thomson waits out the back of the pack. The ball comes out and off he goes. He runs inside 50 and kicks the goal. BEHIND SWANSBird hurries the snap at goal through traffic, but misses to the right. It has been a very intense start to the match with Collingwood on the back foot. Welcome to Sydney for tonight's big one. It's the Sydney Swans vs Collingwood.